Somehow, this is not an insane opinion to hold. 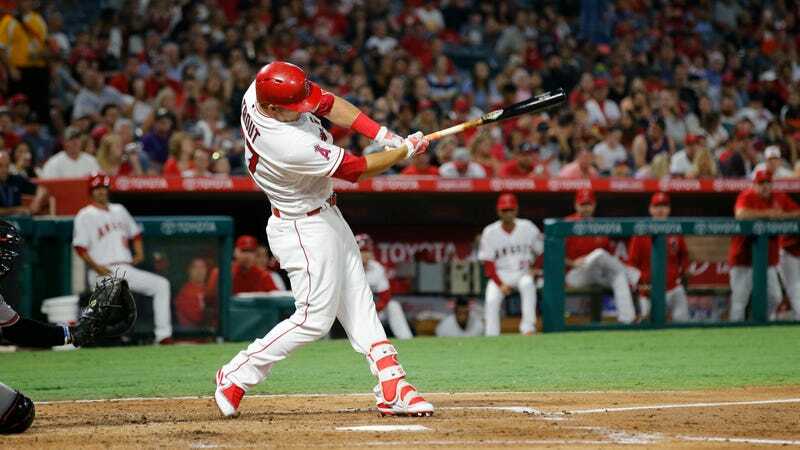 Trout missed 39 games for the Angels this season after tearing a ligament in his thumb, but since coming back from the DL is hitting .363/.469/.663. For the season, he’s hitting .343/.464/.716. The important caveat here is that he’s played in only 68 games, giving him the benefit of a small-ish sample size. But you can’t really small-ish sample size your way into a 216 OPS+, and the small number of games played only serves to make his 5.0 fWAR even more impressive. Trout doesn’t even have enough plate appearances to qualify for FanGraphs’s WAR leaderboard, and yet he’s in the top five. The suddenly cold Aaron Judge has accumulated 6.0 fWAR in 462 plate appearances; Jose Altuve, probably Trout’s stiffest competition in the MVP race, has 5.7 fWAR in 473 plate appearances. And yet there’s Trout, with just 302 plate appearances, right on their heels. It’s not unthinkable that he could end up catching both of those guys despite giving them a 40-game head start. Trout’s ZiPS projection for his 2017 season (via FanGraphs) forecasts him playing 41 of the Angels’ 48 remaining games, and hitting .305/.424/.596. The projections says he’ll add another 2.3 fWAR, bringing his total to 7.3 fWAR in 109 games. That’s a higher WAR-per-game ratio than he had in 2016, when he finished with 10.5 fWAR. If Altuve wins AL MVP this year, it will be greatly deserved. He, like Trout, is obviously a generational talent and is fun as hell, too. It’s likely that Trout’s shortened season will prevent him from winning the award, but for him to even be in the conversation with a guy who is as good as Altuve despite missing 40 games is ridiculous. When Trout went to the DL it was a very “well, there goes the MVP award” event; Altuve won’t be an undeserving winner (as was, I’d argue, Josh Donaldson in 2015), but it will be hard not to wonder what would have happened if Trout had stayed healthy. Trout was on pace for his best season ever before he got hurt, and he won’t even end up falling very short of that promise. Christ, imagine what he might do next year with a full season of at-bats. See you in October, when we can all really start arguing about whether an injury-shortened but dominant season is worthy of the MVP award, all while Trout misses out on yet another postseason.